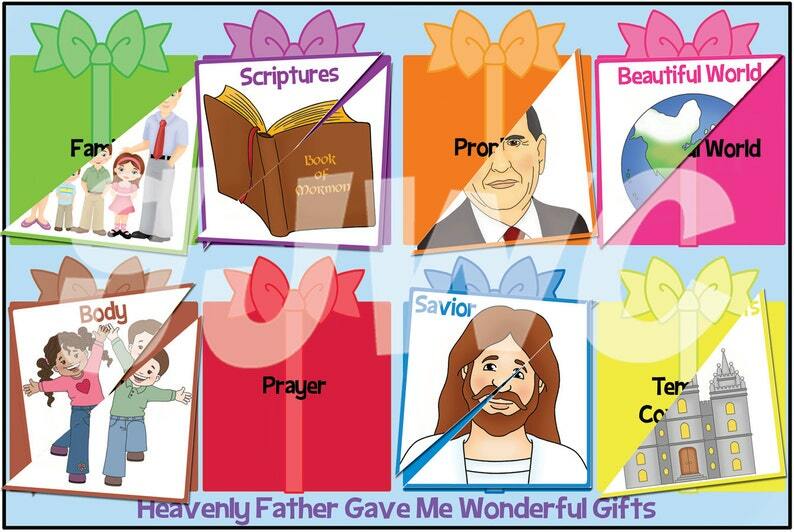 This file folder game features the WONDERFUL GIFTS that HEAVENLY FATHER has given us. Your child will enjoy putting all the pieces in the right place in this cute file folder game. The game includes a 2 piece background with the gifts on them. There are 8 cards with different color borders, for your child to match up the right gifts. Cut each card in half on the diagonal line, so that each gift comes in 2 pieces. Everything comes full color, ready to print and cut out. Everything fits on an 8 1/2" x 11" sheet. There are instructions included on how to make it, and how to play with it. You can print them yourself, or take them to Walmart, Staples, or somewhere similar to have them printed. If you laminate the game or use clear contact paper it will last for years of enjoyment!